Another Kent Cochrane photo c1947. Of interest is the heavyweight cars with the taller windows, the old NKP brass O&W coaches are a match for some of these cars. Still working on digging a few of them up. 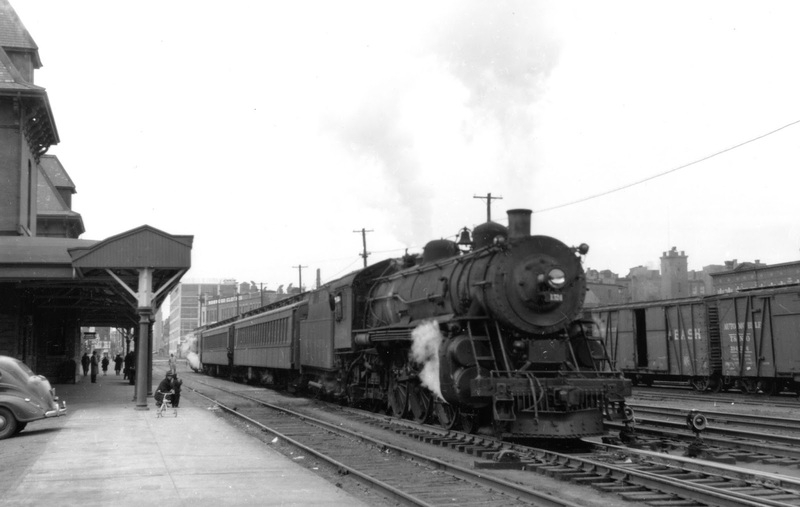 Note the baggage car at the end of the train. Once again the wooden baggage car produced by Bethlehem Car Works. They didn't turn the trains in Waterbury, so you can easily spot eastbound trains on the Highland in photos because of this. Although I haven't mentioned it in the earlier photos, the I-2 was produced in brass by Crown Custom. It's a beautiful locomotive, and veteran New Haven modeler, steam aficionado and very early NHRHTA member John Pryke's favorite brass NH locomotive (other than his scratch-built R-3-a, of course). Both very accurate in its execution and very smooth running, the model was released both with the cab control box, seen on the pilot in this photo, and without. Since the Highland Line did not have a cab control system installed, so both variations are appropriate on the layout. I have one of each and haven't settled on the road numbers to use just yet. The I-2 class was the primary steam locomotive in passenger service on the Highland Line. The smaller I-1 class (which has never been produced as a model), was the second most common, with the I-4 (produced by Crown Custom in brass and, more recently, Broadway Limited) more common as other locomotives were retired. Photos of both to come. All were replaced in passenger service on the Highland by spring 1948 by DERS-1b class (ALCo RS-1) locomotives. Unlike most of the other steam, this model needs virtually no modifications as the New Haven made very few modifications to this class over their lifetime. A few details stand out under closer scrutiny when compared to the photo of #1300 here. This locomotive has a pilot plow applied, where #1300 did not at the time of that photo. These seem to have been installed as needed, and photos of the same locomotive over time can have it with or without. Also the number board on #1324 has been replaced with a simple painted one, as opposed to the original cast bronze (?) one seen on #1300. Most likely it was stolen. Behind the train are Wabash and T&NO single sheathed automobile cars. No road number is visible on the Wabash one, but the Murphy ends place it in one of seven series: 40000-40999, 45000-45399, 45400-45999, 46000-46001, 46002-46699, 46700-46999, 74600-46999; although two of those series (45400-, and 46000-series) had at least some cars delivered with steel doors. Speedwitch Media had a single-sheathed Wabash automobile car, I don't recall which specific details. I have the F&C version which has the correct Murphy ends for this car. One of the nice things about the Speedwitch version was the etched metal towing staples that are very difficult to see in photos of the cars and were missed by the F&C kits. They'll be easy enough to fabricate, though. The T&NO car is also easy to model. It's a Speedwitch Media model of that series of cars, the A-50-4 class built in 1921. These cars are most likely sitting in the yard waiting to be added to a Hartford to Maybrook freight that evening. The Whiting Street Yard had a concrete unloading ramp suitable for unloading autos, and these would have been unloaded there before being brought up to New Britain Yard as pictured here. I'm sorry to say that Karen has since passed away, so this scene on the layout will have a more personal connection than just the father and son moment in the photo. Thanks Karen!